V.C. : I’m obsessed with fashion. I just love everything about it and can look at fashion magazines for hours, which compared to the serious work I normally do probably seems pretty trivial. I also really love baking – I could bake cookies and pies all day. If I wasn’t a writer, I’d either be in the fashion industry or a baker. Or maybe even both – if that’s allowed! When Cindy and I get together, it doesn’t matter where we are there are always to things that happen: shopping and dessert consumption. C.L. : I was about 16 and there was a contest in Seventeen Magazine to write a really short book…about 60 or 70 pages. I remember sitting on my pink carpeting with my old typewriter and writing about a fictional character who was really me who had a cool job on a radio station (again me) as a student intern. It was a contest and I won one of the prizes and $50, which was really exciting! V.C. : That’s an easy one, Jex Malone is my first book and I was in my 30s when we started on the project. I wrote a first chapter of a book when I was 10, but it was awful so it went into the trash bin. C.L. : When I went to school, no one called it bullying, but there was a girl named Kathy B who was always picked on. She had cat-eyed glasses and this weird chopped up haircut that her mom did at home to save money. And she wore really old clothes that were not in fashion. My friend Barb and I were always nice to Kathy B because we felt so bad that everyone picked on her. The greatest thing I learned at school was that everyone needs a little kindness, especially when the odds are not in their favor. V.C. : How to ask questions, and more importantly not to be afraid to ask tough questions. I was very fortunate to have teachers who encouraged their students to think independently. To this day, that skill serves me very well because I won’t make decisions with incomplete information, so I can be pretty relentless in asking questions - but I almost always get the answers I am looking for! V.C. : Impatient, focused and generous. Did you learn anything from writing Jex Malone and what was it? C.L. : I learned that you can never, ever, ever give up on your dream. Vickie and I heard a bunch of “no’s” on our way to publishing our book with Merit Press. Sure, we were sad and disappointed, but we never thought about giving up. We had book companies that wanted Jex to make out more – or even make out with a teacher! We said no and didn’t get a deal with them. But we held onto our dream and knew that someday it would come true at the right time with the right people who believed in us. So I learned that you never give up and that great things happen in your life at the right time. I also learned how fun it is to write a book with your BFF! V.C. : That Cindy and I can do anything we set our minds too! Really, even though we worked on this book for years, there was never a moment we doubted it eventually would be published. Both of us are can be very impatient people – which is why the news business suits us so perfectly – but we were very calm about this process. We knew the right time for Jex Malone would come, and here we are! For those who are unfamiliar with Jex, how would you introduce her? C.L. : I was say that Jex is every girl…she’s got a bit of an attitude because deep down inside she’s sensitive and doesn’t want to be hurt because her father hurt her by not being involved in her childhood. So, she pretends that she’s kind of tough, but really wants to do the right thing. She also really loves her friends and would do anything for them. And she has a mixed up relationship with her father, but she’s willing to work on it. Oh, one more thing…she’s also a big romantic, but won’t admit it! V.C. : Jex is a thoroughly independent young woman. It’s not just that she is bold and unafraid, at her core she’s is very comfortable with who she is. She goes with her gut instinct, and then worries (just a little bit) about what people will think of her later. That can sometimes be a very difficult trait, but it allows her to be who she really is. There’s no pretense about Jex whatsoever. C.L. : I loved Cooper because he’s really like Jex. He’s got a great, generous heart and wants to find true friendship and maybe even love. But he’s really into self-protecting because his entire life he has “been that boy with the weird family whose sister disappeared.” Cooper just cracks the door open a little bit because he doesn’t want to get hurt. When he meets Jex, a girl who is cautious too, they need to take baby steps before they can trust each other. I also LOVED writing Cooper’s totally ‘80s mother Ricki who is a real piece of work. V.C. : Cooper is in many ways such a typical guy. He doesn’t know what to say or do, so he says and does nothing. That can be frustrating, but he’s not the typical impulsive teenage guy. He is a “still waters run deep” kind of person and that’s fun to write because some of the greatest guys I’ve met are like that. V.C. : I’d like to see what Nat and Hermione Granger from Harry Potter could cook up in lab. I think the two of them together would be quite the force! C.L. : I would tell readers to dream big. There will be plenty of people in life who will tell you that you can’t, but what do they know? If you have a dream, believe in yourself and then just work hard. There is no substitute for good, old-fashioned hard work. You can’t just dream. You have to “do it” too. I’d also tell readers to once in awhile put down the electronics and just talk to your friends…look them in the eye, hang out, go outside and experience life. Life is not just what’s going on with a keyboard. V.C. : Don’t be afraid to write and have people read your work. I had an intern who once came to me and said she was terrified of having people read her work because she wanted it to be perfect, and the fact is that writing isn’t supposed to be perfect. There is no such thing as perfect writing. Writer’s block is more about fear than not knowing what to say. Just start putting words on the paper – some people will get it and others won’t, but the more you write the better you will get at expressing yourself and the less you worry. V.C. : How are you? I always say “fine”. Can you imagine if ever answered that question with a “stupendous” or “miserable” – people would first think I was a basket case and secondly, they don’t really want to know how you’re doing. Have you ever noticed people’s eyes instantly glaze over the minute you start to answer that question with anything that isn’t “fine”? C.L. : My most memorable summer job was working at Kelly’s Day Camp in Half Day, Illinois as the drama teacher. Our play that summer was “Footloose” and I taught all the kids to kick off their flip flops during the “kick off your Sunday shoes” part of the main song. What I didn’t figure is that when we had an audience, the shoes would fly off and hit people in the head! V.C. : Between my junior and senior year of college, I was an intern at the Boston Globe’s bureau in Washington, D.C. All the grown-up reporters were busy covering a presidential campaign and I had all of Capitol Hill to cover for the summer. All the politicians treated me like I was a real reporter, even though looking back I was so inexperienced. It was the best feeling finally being treated like an adult and doing exactly what you imagined yourself doing. I love history, so Washington is a magical place for me. C.L. : I think it’s really scary when you have to deal with someone in your family who is sick. My Mom died of cancer when she was only 53 and we dealt with a lot of tough illness times in our family. If anyone reading this has a sick relative please know that I really feel for you. Take a deep breath and just get through each day. Spend as much time as you can with the people you love. V.C. : Like everyone else, loneliness. I adore my family and friends, and can’t imagine what life would be without them. C.L. : Oh, definite the love with the heartbreak, but hopefully there wouldn’t be heartbreak. (Come on! I believe in happy endings!) You should never miss out on the love. V.C. : The funny thing about heart break is that it really doesn’t last. The world is full of fantastic people who can help repair a broken heart. I can’t imagine a life where you’ve never loved before. C.L. : Wow, what an interesting question. I think anyone would want to go back in time and somehow stop what happened on 9-11. That was a real turning point in our country and in our lives. My friend Roger Ebert said it best. He was in a movie at the Toronto Film Festival on 9-11. He wrote, “I walked out of the movie and into a brand new world.” It’s hard for kids today to know that feeling where you really weren’t afraid of terrorists. V.C. : On a completely personal level, I would have been more of a kid when I was a kid. I was definitely an overly serious teenager. I had a few close friends in high school and sometimes we had fun hanging out, but I was too focused on college. Then I got to college where I had more amazing friends and we did have a lot of fun, but I spent every spring break and summer working so that when I graduated I could get a great job (which I did!). I never once went to spring break with my college friends or just hung out on an afternoon wasting time. You get to a point in your life when you don’t have time to just chill, and now I wish I’d done that more! C.L. : I really did like being a teen in the 1980s, but I couldn’t do the big hair and I didn’t look so good in neon! It would have been interesting to be a teen in the ‘60s during that era of great change. V.C. : The1960s, definitely the 1960s – isn’t that funny we both picked the same decade, because let me just say it that neither of us could have pulled off those psychedelic prints! But I think teenagers had more freedom and opportunity to make the lives they wanted than any era after that. Now everyone goes to high school worrying about building the perfect college application, and everyone in college is building the perfect resume. It’s so competitive that the time to explore ideas and think about who you want to be isn’t as available as it was in the 1960s. C.L. : I was very sad when I lost my beloved dog Cody last year. She was my girl for 17 years! There is a reason Jex Malone has a dog named Cody. My Cody was a brave, loving, wonderful girl! V.C. : I really don’t cry very often at all (it’s not that I’m not sentimental, really I am!). Looking at my son’s baby pictures always brings a tear to my eye because he’s now 12 and is becoming such a “guy”. I have loved being a mom so much I can’t even think about what a wonderful little kid he was without getting a little teary, even though I am looking forward to having a grown-up son, just not so fast! V.C. : On Twitter – and please do! @vickiecusf is my Twitter handle and you can follow Jex on @jexmalone on both Twitter and Instagram. I love talking to people on Twitter so much, it’s the best! A famous case. A missing girl. If they find her, will they be heroes? Or dead? Bored out of her mind during a summer with her police detective father in Las Vegas, Jessica (aka "Jex") Malone starts doing what she does best--snooping. When she meets three new friends who share her passion for crime, from the geek to the fashionista, suddenly, the stifling desert days don't seem so long. Her dad is never around, just like when her parents were married. But Jex's crew, the Drew-Ids, take the pledge of eternal secrecy and then get down to the good stuff--digging through the cold-case files in Dad's home office. One of them, the thirteen-year-old case of Patty Matthews, is still a mystery. Finding Patty, who vanished into thin air, became such an obsession for Jex's father that it destroyed the Malones' marriage. So not only is this a big deal, it's personal. Jex is determined to find out what really happened, and her excitement is contagious. Soon her friends are all on board and so is the missing girl's brother, the hunky Cooper Matthews. But as they dig up more and more troubling information--more than the cops ever did--they also get the clear message that someone out there wants to prevent the truth from coming out. That somebody is also prepared to do anything, absolutely anything, to prevent it. Jex isn't afraid; after all, she's a cop's daughter. But maybe she should be. Laced with humor, toughness, and real CSI investigation techniques, Jex Malone could be the Nancy Drew for a new generation--but with a chilling twist. These wannabe detectives are on the brink of finding out the fate of poor missing Patty. But will they disappear without a trace, too? Thank you C.L. Gaber & V.C. Stanley for making this giveaway possible. 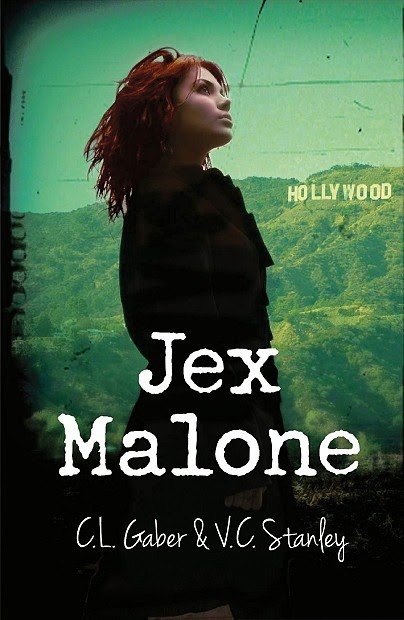 3 Winners will receive a Copy of Jex Malone by C.L. Gaber & V.C. Stanley. I have always enjoyed reading Dean Koontz, mainly because a lot of his books seem to me that they could really happen, not like Stephen King, his are great books but most do not seem like they could happen. I have always wanted to talk to Koontz, and see how he comes up with some of his scenarios. My father - I miss him. It would be with Robert Pattinson and Jonathan Rhys Meyers. The guy I really like.